St Peters Anglican Church, Alresford, Essex, England. Photo supplied by Bev. Morphett. Family tree provided by Shirley Brierley of Sydney ( a descendant of Eliza Welham, one of Samuel and Eliza's daughters). 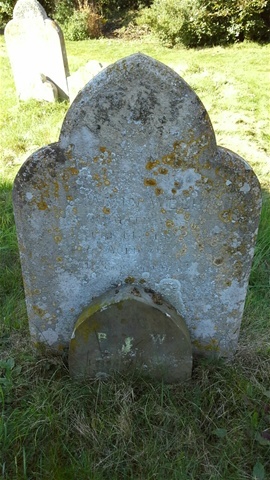 Shirley traced the family back to William Welham - born about 1740, died 1808. His children are highlighted in red and his grandchildren including Samuel in blue. Benjamin was Samuel's youngest brother who was born, and died in Arlesford, Essex, England. Photo supplied by Bev Morphett. I am a descendant of Benjamin Welham,(born 1821). He was my Great Great Grandfather. His daughter Mary Ann Welham married Daniel Balls in 1873. 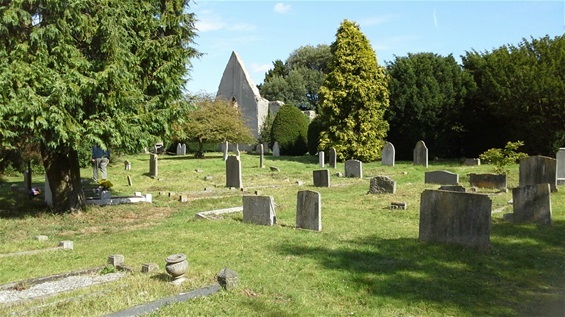 They are both buried in Alresford Churchyard near the entrance, underneath a yew tree. Their son Frederick was my grand-father who I knew well. He was born in1874 in Alresford and in later years lived in Wivenhoe. 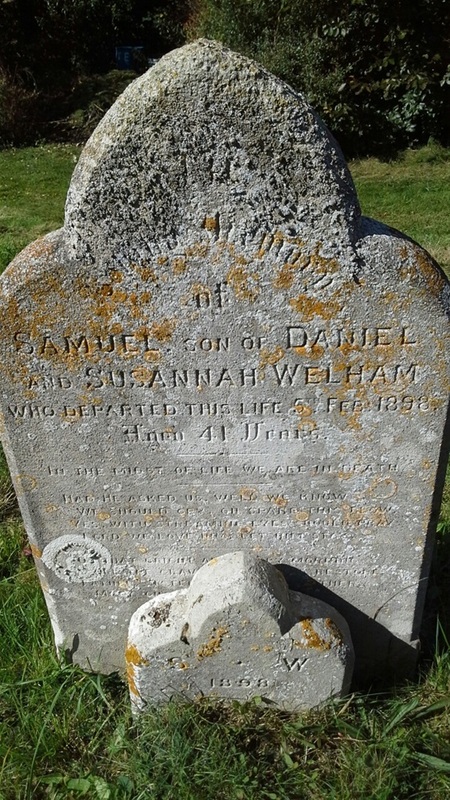 Gravestone of Samuel Welham (died in 1898),who predeceased his parents Daniel Welham (1821-1910) and Susannah Welham (nee Shead -1824-1905). Daniel was a brother of "our" Samuel who migrated to Australia, so this Samuel would have been his nephew. Photo supplied by Bev. Morphett. The following article may be "our" Samuel who migrated to NSW Australia with his wife and 5 children in 1841. He was born in 1801 which makes the age correct and one of his brothers was named James. Samuel was a brickmaker and Elmstead is in Essex. Samuel Welham, 32, brickmaker, was indicted for feloniously killing and slaying John Dines, at the parish of Elmstead. - Mr Round conducted the case for the prosecution.- The prisoner was defended by Mr Mirehouse. Samuel Francis examined. On the evening of the 8th December, I had been, with some of my fellow workmen, to the Bowling Green public house, at Elmstead. Deceased was of the party. We went to the house about 10 o'clock, and left a few minutes after twelve. When I went out, I saw the two Welhams, about a rod and a half from the public house. I went with my party on the Frating Road. Two men named Wassey and Studd joined us, and a few minutes after, I heard Wassey say to Studd, "You'd best be going as you will be hided". James Welham then followed Studd, and struck him a blow with a stick, but it did not knock him down. He struck him a second time, and Studd fell. When he was getting up, he struck at him again, be he avoided the blow. I then saw Samuel Welham go to Cleary, and strike him with a stick over the shoulders; he dropped the stick, and I picked it up. He then turned round, took a pale from Wassey, and was walking away. Dines followed him and said - "I'll stand you." Welham said - "Will you?" and immediately struck him a heavy blow with the pale upon the side of the head, which knocked him down. Joseph Wassey. On the night of the 8th December Dines came to my house. I saw blood running down the right side of his face, his head was cut, and he complained of Samuel Welham, who he said had knocked him down with a stick. I washed the blood off his head. He resided about 40 or 50 rods from my house. Mary Dines. I am the daughter of the deceased. My father came home about one o'clock; he was ill; he was sick in the course of the night; he was getting worse, and Mr Smith the surgeon, was sent for. My father died about 12 o'clock on Monday. Mr Benjamin Smith. I am a surgeon, at Wivenhoe. On Sunday, the 9th of December, I was called to attend John Dines. I found him insensible - he appeared to be labouring under compression of the brain - and I saw a wound on the right side of the head. The symptons were these - he was insensible - there was difficult breathing- general prostration - and a fixed pupil of the eye which was not obedient to light. They were the effects of a blow or a fall. I do not think death was occasioned by the wound itself, but there was a rupture of a blood vessel immediately under it. The rupture of the blood vessel was the cause of death, and that rupture might have been occasioned by a blow or fall. - Cross-examined. Drinking to excess would have accelerated death, but would not have caused it without the blow. Robert Todd. I am constable of Elmstead; I apprehended the prisoner by direction of the parish officer, on the Sunday. I told him I was afraid it was a serious charge, for he had struck Dines a blow. He took the stick from the top of the house and said - "This is the stick I struck somebody with, but I don't know who." (The stick was produced. It was a round paling as thick as a man's wrist, with two large nails in it.) - The prisoner said nothing in his defence. - Mr Simons, one of the Jury, said he had known the prisoner 25 years; he was a humane man, and bore a good character. Lord Lyndhurst summed up the evidence, at some length, and the Jury found the prisoner Guilty. His Lordship commented on the brutality of a man under any circumstances, making use of such a deadly weapon as that which had been produced, and sentenced the prisoner to twelve month's hard labour.